Epic has introduced vending machines into Fortnite. Here’s how to track them down. The new vending machines in Fortnite allow you to swap out raw materials for deadly weapons or health-giving chug jugs. You will want to know exactly where on the map they are to take full advantage of them. As you can see, they are spread pretty evenly around the map, and a cluster of trees is never that far away if you need some wood. Lots of them are also nestled near buildings if you need other materials. To use the vending machines, simply walk up to the and hold Square on PS4. If you don’t have the required materials, it will cycle to the next selection. There is loot available for swapping wood, stone, and metal in each. You generally need 500 of whatever material you are planning to feed into it. There you have it – you are now armed with the knowledge you need. You know how Fortnite’s vending machines work, you know the vending machine locations, and now you just need to parachute in and get that victory royale. We believe in you. One of the Week 8 Challenges is to use a vending machine so that’s one you cross off your list pretty quickly and easily. 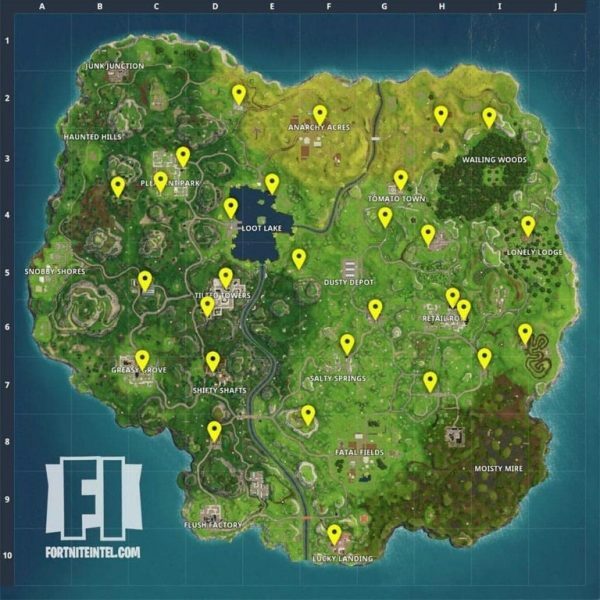 Once you know where the vending machines are, it makes the rest of the weekly challenges easier. Here’s a handy list of any you might have missed. Now all you need to do is wait for Fortnite Season 4, which begins in May.